Received October 17, 2018; Revised February 10, 2019; Accepted February 13, 2019. Popliteal vein aneurysms (PVAs) represent a rare form of venous aneurysms and necessitate prompt management because of their well-established risk of pulmonary embolism (PE). Herein, we report a rare case of PVA without PE, successfully treated with open surgical repair. A 27-year-old man presented to our vascular clinic with chronic pain and swelling in his left lower limb. He had a long history of facial surgeries for the removal of congenital multiple osteomas. Physical examination revealed varicosities with an abnormal distribution. Duplex ultrasound showed a left PVA measuring 2.3 cm in diameter and 4 cm in length. Open surgical excision of the PVA with lateral venorrhaphy was performed through a medial approach. Prophylactic anticoagulation was performed postoperatively. In this case, the PVA was detected, with a high degree of suspicion by the clinician, before it caused fatal PE. The patient was successfully treated with aneurysm excision and lateral venorrhaphy. Popliteal vein aneurysms (PVAs) represent a rare form of venous aneurysms and require prompt diagnosis and management because of their well-established risk of pulmonary embolism (PE) . Once a massive PE occurs, the outcome can be fatal. Early suspicion and diagnosis of the disease are essential to prevent catastrophic complications. PVAs tend to be found in patients with severe thromboembolism without warning symptoms, such as leg pain or swelling . Fortunately, in some cases, a PVA can be diagnosed in the absence of PE, on the basis of a high degree of suspicion by the vascular surgeon . Herein, we report a rare case of PVA without PE, which was successfully treated with open surgical repair. A 27-year-old man presented to our vascular clinic with chronic pain and multiple areas of swelling in his left lower limb. He had a long history of plastic surgeries of the face for the removal of congenital multiple osteomas (Fig. 1). The patient denied receiving any drug during other surgeries. Physical examination revealed abnormally distributed varicosities (in the lateral, medial, and anterior aspects of the thigh, lateral knee, and lateral leg), lower-limb swelling, scrotal hydrocele, and multiple osteomas causing disfigurement in the face, upper limb, lower limb, and fingers. Duplex ultrasound (DUS) and magnetic resonance venography showed primary varicose veins with a patent deep venous system. Unexpectedly, a left PVA measuring 2.3 cm in diameter and 4 cm in length was found (Fig. 2). Because of the high risk of PE, open surgical excision of the PVA with lateral venorrhaphy was performed through a medial approach (Fig. 3). A 10–12-cm longitudinal skin incision was made on the medial aspect of the thigh along the anticipated anterior border of the sartorius muscle. The skin incision was advanced deeper through the subcutaneous tissue, exposing the adductor tendon anteriorly and the sartorius muscle posteriorly. The fascia between these two muscles was incised to enter the popliteal fossa. A self-retaining retractor was placed deep in the wound until the popliteal vein was exposed. Once the popliteal vein was exposed, the thin aneurysm sac could be easily differentiated from a grossly normal vein wall, and a vascular clamp was placed tangentially across the transition area. The clamp was then undersewn with running mattress stitches using 6-0 vascular sutures. Rivaroxaban 10 mg (Xarelto, 10 mg once daily; Bayer, Leverkusen, Germany) was administered postoperatively for prophylactic anticoagulation. Three months later, DUS revealed deep vein thrombosis in the popliteal vein. Therapeutic anticoagulation was continued for 3 months thereafter. PVAs are rare. In 2006, only 105 cases have been reported in the world literature . By 2018, this number has increased to only 146 cases. Various etiologies associated with a popliteal venous pathology have been suggested, including congenital abnormality, trauma, localized degenerative changes, or inflammation in the form of varicose veins, venous aneurysm, or arteriovenous fistula. Primary PVA represents a rare subset of venous aneurysms, with an estimated prevalence for asymptomatic PVAs of 0.1% to 0.2% among patients undergoing venous duplex imaging for various chronic venous symptoms . PVAs can occur at any age, and they have been reported in patients aged 10–86 years. A female preponderance has been noted in three previous series, and the median ages at presentation were 51 years in men and 49 years in women . The etiology of PVAs is unclear, although aneurysmal changes are known to result from increased hemodynamic pressure at the site of venous mural weakness, possibly caused by trauma, inflammation, congenital weakness, and degenerative changes . In this case, the cause of the PVA was unclear, and the relationship between the PVA and the congenital multiple osteomas is unknown. To our knowledge, this is the first case of a combined presentation of PVA and osteomas ever reported in the English literature. Aneurysmal dilatation may precede the formation of mural thrombi owing to turbulent venous flow. The presence of thrombi in PVAs may differ from the pathophysiology of deep vein thrombosis, which usually starts in the valve cusps or at injury sites. PVAs tend to be found in patients with severe PE without warning symptoms such as leg pain and swelling . Even small PVAs have been documented to be a source of emboli, precluding the stratification of thromboembolic risk according to aneurysmal size. Symptomatic PVA typically presents either acutely with PE or with a more chronic history of localized symptoms related to a popliteal mass or venous insufficiency. In some aneurysms, local pain originates from the PVA itself or from direct compression of neural structures due to aneurysmal dilatation. In a case series, the potentially life-threatening complication of PE occurred in 43% of the patients . The presence of an intra-aneurysmal thrombus is a clear risk factor for PE (69% patients had mural thrombi and 23% did not have thrombi) . The characteristic microscopic features of PVA are fragmentation of elastic lamellae and fibrosis replacing the medial smooth muscle . The size criterion for the treatment of PVA varied among different publications, with sizes two or three times larger than the normal vein size (5–7 mm) being recommended for treatment . However, the best method for size measurement and the effect of the body position on the size measurement are not yet defined. The diagnosis can be made using ascending venography, computed tomography, magnetic resonance imaging, and DUS. We recommend magnetic resonance imaging as the best and most anatomically precise modality. However, the cost-effectiveness should also be evaluated. The treatment options for PVA are considered on a case-by-case basis. In patients with PE, surgery for PVA is the treatment of choice to prevent recurrence. Surgery is also recommended in cases of aneurysms with thrombus in the sac, as well as for saccular-type or large fusiform aneurysms because of their high risk for thromboembolism. However, if the aneurysm is fusiform in shape and smaller than 2 cm, close observation can be performed safely without complications . Although no consensus has been reached about postoperative anticoagulation, prophylactic anticoagulation may be a reasonable option . In conclusion, a PVA occurring with multiple osteomas was found, with a high degree of suspicion by the vascular surgeon, before it caused fatal PE. The patient was successfully treated with aneurysm excision and lateral venorrhaphy. Fig. 1. (A, B) Multiple osteomas on both hands (blue arrows). (C) Radiographic image showing deformities in both hands with multiple osteomas (orange arrows). Fig. 2. 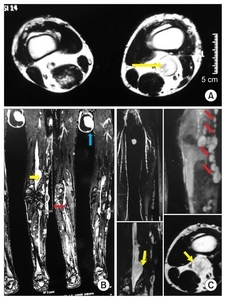 (A) Axial view of magnetic resonance venography showing a left popliteal vein aneurysm (PVA) with intraluminal thrombi (yellow arrow). (B) Coronal view of the left PVA (yellow arrow), showing superficial varicosities in the lateral thigh and calf (orange arrow) and a scrotal hydrocele (blue arrow). (C) Superficial varicosities (red arrows) and PVA with intramural thrombi (yellow arrows). Fig. 3. (A) Exposure of the left popliteal vein aneurysm through a medial approach (arrows). (B) Photograph of aneurysm excision and lateral venorrhaphy (arrows). Kelay A, Constantinou J, Hamilton H. A rare and potentially fatal cause of popliteal fossa swelling. BMJ Case Rep 2014;2014 bcr2013201971. Hong D, Song SW. Pulmonary embolism caused by popliteal venous aneurysm. Korean J Thorac Cardiovasc Surg 2013;46:76-79. Han S, Ryu JW. Tangential resection of a popliteal vein aneurysm in a patient complaining of localized popliteal pain. Vasc Spec Int 2016;32:33-36. Bergqvist D, Björck M, Ljungman C. Popliteal venous aneurysm–a systematic review. World J Surg 2006;30:273-279. Franco G. Ultrasonographic exploration for recurrent varicose veins in the 123 popliteal fossa after surgery. J Mal Vasc 1997;22:336-342. Sessa C, Nicolini P, Perrin M, Farah I, Magne JL, Guidicelli H. Management of symptomatic and asymptomatic popliteal venous aneurysms: a retrospective analysis of 25 patients and review of the literature. J Vasc Surg 2000;32:902-912. McDevitt DT, Lohr JM, Martin KD, Welling RE, Sampson MG. Bilateral popliteal vein aneurysms. Ann Vasc Surg 1993;7:282-286. Wright LB, Matchett WJ, Cruz CP, James CA, Culp WC, Eidt JF, et al. Popliteal artery disease: diagnosis and treatment. Radiographics 2004;24:467-479. Gasparis AP, Awadallah M, Meisner RJ, Lo C, Labropoulos N. Recurrent popliteal vein aneurysm. J Vasc Surg 2010;51:453-457. Maleti O, Lugli M, Collura M. Anévrysmes veineux poplités: expérience personnelle. Phlebologic 1997;50:53-59.